We would like to announce that we have a new Head Piercer and front counter receptionist at our Sterling Heights location! Randee Saenz has been piercing professionally in Michigan since 2013, using only the highest quality implant grade jewelry. She offers jewelry from all the top quality companies including Industrial Strength, Anatometal, NeoMetal, and Michigan made 14k Gold from Sleeping Goddess Jewelry. Randee started her career at Liquid Chaos in Dearborn Heights, has worked at Splash of Color in East Lansing, as well as Evolved Artforms in Mount Pleasant, Michigan. At a young age, she worked diligently to get herself a scholarship to attend the Association of Professional Piercers Conference in Las Vegas, to better her knowledge of the industry and learn new ways to perfect her craft. 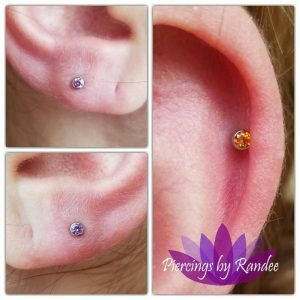 She took a full week of classes related to body piercing, jewelry quality, and sterile techniques to ensure you are getting the best materials for your healing piercings. After apprenticing for over a year, and perfecting her craft she has now made Vicious Ink her new home. She offers all types of oral and body piercings, including surface anchors, and tooth gems! One thing Randee loves to pierce is children’s ears. She is highly against children getting their ears pierced at the local mall with a 16 year old girl piercing them with a piercing gun, and would much rather have the children get them done in a safe and sterile environment while using the highest quality piercing needles and equipment. The one thing though about piercing minors ears is that she wants the child to be able to ask for it themselves and make sure the parent isn’t pushing the child to do it and for the child and parent to both listen and understand the aftercare and how to take care of it. A lot of times surprisingly the young 8 and 9 year old’s pay more attention then the 19 or 20 years old’s do that we see here. Lol. 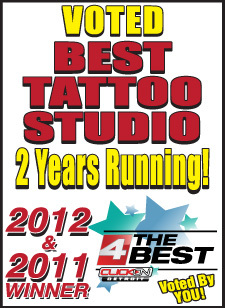 If you have any questions for Randee and would like to meet her then stop in the shop and say hi! 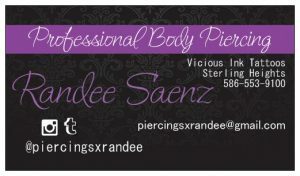 You can reach her on instagram @ piercingsxrandee or on her facebook page or ours. She is excitingly waiting to meet new clients and to do what she loves to do which is make her customers so happy with beautiful new piercings and exceptionally well made jewelry.